The NFL Playoffs are rapidly approaching and after the last month or so that the Steelers have had, they are still in the Wild Card hunt!!! Woo Hoo! It will take help from some other teams for them to get in, but I think it could be a good possibility. Against a good Bears defense that had won 8 in a row, the Steelers had a great dominating game. They got back to basics and cleaned up a bunch of the mistakes that had been haunting them. 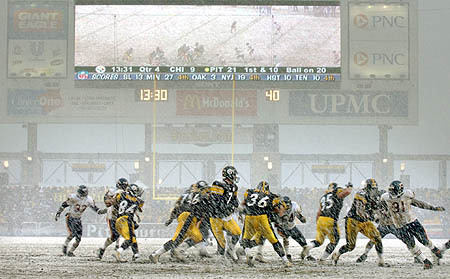 The second half was a fun snow bowl, with the Bus coming out of the shed and plowing over everybody for another 100 yard game. Not bloody likely! The Vikings boat party will cruise over the Stillers on Sunday! That's what you think... Too bad the boat is frozen stuck in the middle of Lake Minnetonka!! !